Mina has started integrating all the stories that we read into our own stories. It has been fun over the past few weeks sculpting and changing the story as we go. There is one story in particular that is now a bedtime ritual. It started in March, quite simply, when I brought back my seashell collection from RI. I remembered finding a particular shell and told her about it. I had found a conch shell on the beach, took it home and soon realized it still had an “inhabitant” inside! Mom had come into the kitchen and saw this huge snail crawling up her kitchen counter. Once upon a time, before there was a Mina, before Mama was a Mama, before Baba was a Baba, and before Nana was a Nana (last nights addition to the story by Mina), Mama went to the beach. As she was folding up her beach blanket and towel something caught her eye. There, in the waves, were tiny dinosaurs. They were jumping and playing in the waves. They were so colorful: red, orange, purple, rainbow-striped, blue-polka-dotted, pink. Mama snuck up behind them and picked them out of the waves one by one and plop plop plop, they went into the bucket to show Nana. As Mama drove home, the rocking motion put the dinosaurs to sleep. When Mama got home, she quietly picked up the bucket, brought it into the house and placed it in the kitchen sink. She was going to give them a bubble bath when they woke up to get the sand off. Then she went upstairs to take a shower. One by one, those dinosaurs WOKE UP!! They started to shake off the sand… shake shake shake… then that turned into dancing… shake shake shake, thump thump thump, boogie boogie boogie. WELL! Don’t you know? Nana was working in the basement and heard all this commotion coming from the kitchen. “What is all this craziness?! !” said Nana to herself and she went upstairs! Imagine her surprise when she saw DINOSAURS dancing and jumping on her kitchen counter! They were swinging from the pots and pans and jumping from one counter to the other. Elif ran down the stairs and together they watched the dinosaurs partying in the kitchen! It looked like so much fun, they decided to join in and dance too! After I tell the story, Mina tells me her version. She has most of it memorized, but usually changes something here and there. Now, in her story, before going to the beach, she adds: Mama has a steering wheel, Baba has a steering wheel, Dede has a steering wheel, Nana has a steering wheel, Sunny has a steering wheel, but not Ava — she is still a little girl, and they all drive to Mr. French’s beach. Then Mama jumps in and swims with the dinosaurs… like this — and then Mina swims in her bed. This storytelling can go on for quite a while! Mina will go on and on for an hour telling her story and acting it out and it makes bedtime just a tad crazier than it already is. I have had to reverse the order of who tells the story first. Now she tells her story first, finishes — eventually, and then I tell my story. Things proceed a bit quicker that way. We just got back from our vacation in Turkey a few weeks ago, along with six kilos of Turkish books for Mina. Yes, and that is AFTER I left some THERE! I found a nice Turkish children’s website and made up a wish list. Everyone just bought from there and it made it easier of everybody. Last year, we all went to a very tiny tiny little bookshop to quickly find some books, not really knowing if they were any good. They had quite a nice selection of books that had been translated from English. I tried to find some that Mina had read at TKE so that she would instantly want to sit down and listen to the Turkish version. The most translated author was Julia Donaldson, an English writer. I first saw her Gruffalo book in the baby section as a board book. I had no idea that she had so many books out! We got Mina the Turkish version of The Gruffalo (Tostoroman) and Room on the Broom (Superge’de Yer Var Mi). Everyone got a kick out of the crazy storylines. Upon returning home, I realized that the author also put out a story/song cd of The Gruffalo. Who knew the Gruffalo could sing? Will that become part of our collection–I haven’t decided yet. I did return to that tiny tiny bookstore to see what they had and found a very cute little book and animal set. It is called Minutka: The Bilingual Dog. It is written in English and Turkish (you can find it in many other languages as well) and it really helps a bilingual child feel OK with knowing two languages. Sometimes, kids might feel singled out for being different, but this book eases the child into feeling comfortable about their abilities. I guess the story hails from Germany and was originally called The Runaway Pancake. 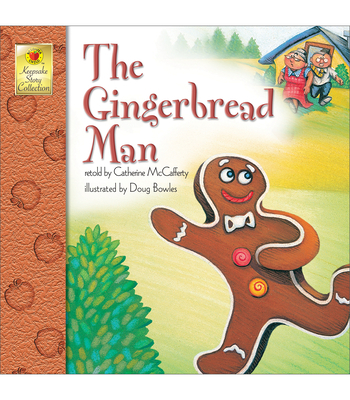 When it hits England, it turns into The Runaway Johnny Cake, and, finally, becomes The Gingerbread Man when it crosses the Atlantic to America. Last year, Mina couldn’t say “Mina,” so she decided to give herself a nickname: Mimi. It was so “Oooo LA LA!” that it has stuck in the family as her little nickname even though she can now properly say “Mina.” We have seen Mimi videos, songs, movies, but we were thrilled when we found a book called Mimi! Mimi by Carol Baicker-McKee is a wonderful little story about a little girl pig named Mimi and her pet Frank, the roly-poly bug. It is also a wonderful example of ingenuity. I am always doing some sort of crafty thing and crafty things take a LOT of time! I read the book and got exhausted by how much work went into creating each page since, as far as I can tell, each is its own unique 3D storyboard that has been photographed. There is so much sewing, glueing, claywork, etc., and each Mimi has a different facial expression. It took a lot of skill and forethought to create this book. It really is, from a craft viewpoint, pretty darn amazing and impressive! Mina really took to the story and wanted to have her own pet Frank. In the story, Frank lives in a yogurt cup. I had to explain to Mina that while that may work in a STORY, it will not work in REAL life. I had remembered seeing a bug box at TKE and went in search of it. I had poor Sue looking all over the store for it and it was right in front of our noses the whole time! We had to let him go before we went to Turkey on vacation, but… Lo and Behold! Frank followed us to Turkey! We spent some time at my aunt’s summer house in a town called Ayvalik. My aunt has a huge garden with a big strawberry patch. One morning, we decided to pick some strawberries and who did we find—FRANK and his whole family. Mina was so excited that Frank decided to come to Turkey too and that he brought his family as well! “They are on vacation too, Mommy! Look, the book had it WRONG! Frank doesn’t like bananas–He Likes STRAWBERRIES!! !” And she was right. There was Frank and his family, cousins and all, devouring my aunt’s strawberry patch. 1 book, 2 books, 3 books , 4! How many books can we fit through the door? Counting has become very big in this house that last few weeks and highlights many of the books that we read each day. I didn’t realize how many counting type books we had until we started on this theme! Last year, we started the counting collection with Counting Colors, a big board book. I brought it over to Turkey on our vacation because I thought it crossed the language barrier and that it could be read in either language and still make sense. It is a great book because we learn colors, counting, and we hone our skills at finding all different pictures. We progressed to Chirstopher Counting in august. It is all about a little rabbit who loves to count and counts everything he sees. It really makes counting fun and that you can count anything, except maybe the stars in the sky! Mina fell in love with Dr. Seuss’s Ten Apples Up On Top at Christmas time and has it just about memorized at this point. How the animals can balance so many apples up on their head and run down the lane is beyond me! The book is a contest, more or less, between three animals (lion, tiger and dog) to see who can get the most apples up on top of their heads without letting them fall. At the moment, she is sitting in the recliner, next to bunny, and reading Ten Apples on top as the bunny “eats” her sunflower seeds. Today’s favorite book at TKE was Ten Red Apples. It is a reprint of an older version, 1968, I believe. I just love the bright colors and graphic images that the old books used to have. This book is about an a farmer and his apple tree. All the animals on his farm, come one by one and eat his apples! This book counts down the number from 10-1. It is a nice contrast to the others which usually count up. We also take the counting theme into our Turkish books and read 1001 Hayvan Bulun (1001 Animals to Spot). Each page is a different animal environment and you need to find a certain number of animals hidden in each scene. We try to balance our stories between Turkish and English and can’t wait to go to the bookstores in Turkey this summer to pick up some more! I took Mina to Gunter Van Hagen’s Bodyworlds exhibit in the beginning of December and had no idea how much of an impact it would make on such a little one. People looked at me like I was crazy bringing Mina in there, but she absolutely LOVED it! She walked around each figure and told me what she saw, and we had to buy See Inside Your Body as well as the exhibit catalog. Both grace our table at mealtimes as we go through the different internal organs and body parts, functions, etc. She loves to look at the exhibit catalog and compare it with the drawings in the children’s book. “This is a heart, and that is a heart! They are the SAME!” She will look at the children’s book at, let’s say, the kidneys, and then want to look at the same thing in the exhibit catalog. As you might imagine, she now has a pretty good understanding of the skeleton, the lungs, heart, the brain and how you poop. I had my annual hip checkup a few weeks ago. As we were driving, I was explaining to Mina that the doctor needed to take a picture of the inside of my hip. “Of mama’s skeleton, like the dinosaurs,” was Mina’s response. I was so surprised that she immediately drew a correlation from the book to the description of an x-ray! She was very excited to see the X-Ray of my hip and told everyone about my skeleton for days later. I nearly fell off the exam table because I was laughing so hard. He took it in stride and said that he left the wocket at home that day. The answer satisfied Mina. She sat back down to re-examine my x-rays again. I had a major dilemma this summer: How do I house ALL of Mina’s books so that they are contained, and easily accessable? I searched and searched the internet and looked at bookcases and shelves, and finally came to the conclusion that the canvas sling bookcases are really the best bet for right now. I purchased mine at www.onestepahead.com, and they are well worth the money; I’m actually thinking about buying another one! I like that it is easy for Mina to put her books away and easy for her to find one to read. I looked at a few of these bookcases and found the ones at One Step Ahead to be better becuase it had two drawers on the bottom. These serve as the board book and flash card drawers. You can fit a TON of books into this thing, and you can also get the canvas sling section personalized with anything you want (up to 12 letters, anyway). If I had thought this idea through one step further, I would have orderd two: one that was personalized “English” and one that said “Turkish.” That way, each language could have its own bookshelf! You are currently browsing the archives for the What’s In Mina’s Book Bag category.